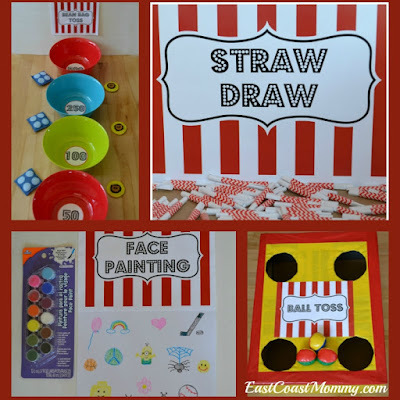 When it comes to children's parties, the little "DIY" details are what make the event special. 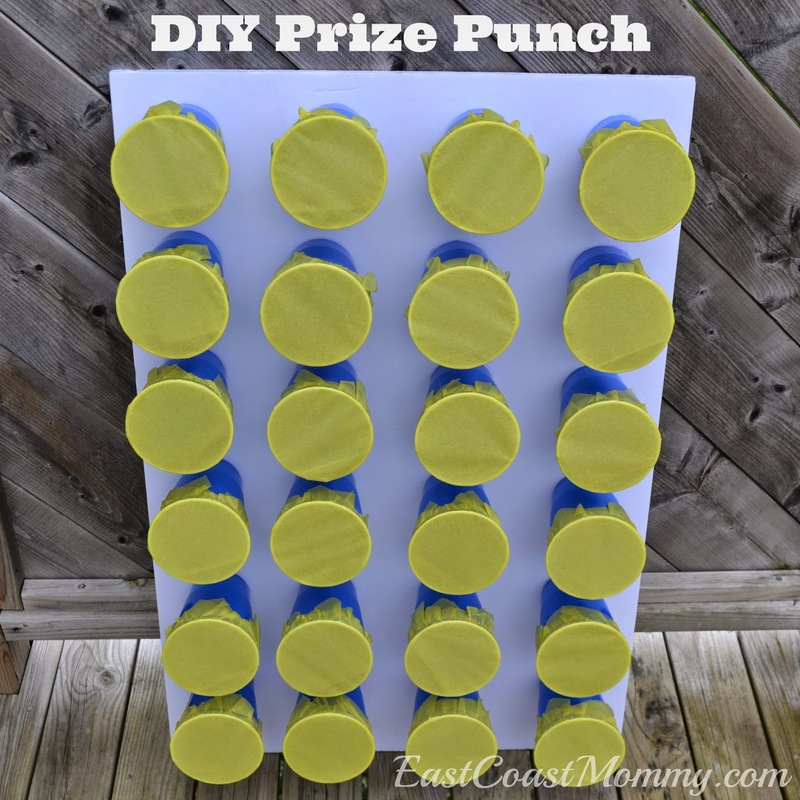 For my son's 9th birthday, I made this simple (and totally fun) DIY prize punch. It was a big hit with the party guests. 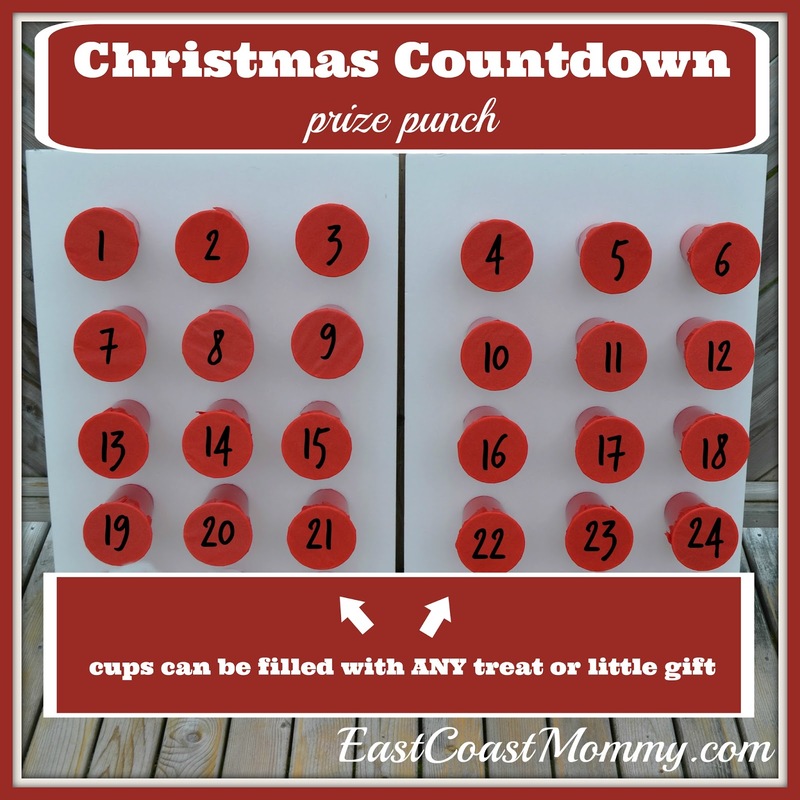 1) Fill each cup with a little prize. (My son's party had a hockey theme, so our cups contained hockey cards.) Any prize will work as long as it fits in the cups. 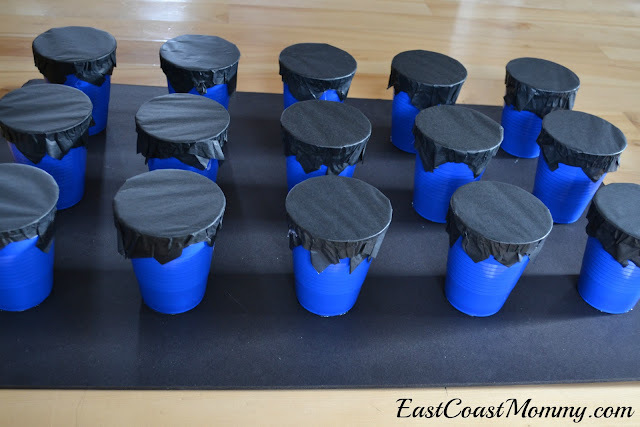 3) Use hot glue to secure the cups to the foam core. That's it! You can use a piece of ribbon to hang the board, or you can lean it against a wall. You can use different colour cups and tissue paper to match the colours scheme of your party too. I absolutely LOVE this idea, don't you? 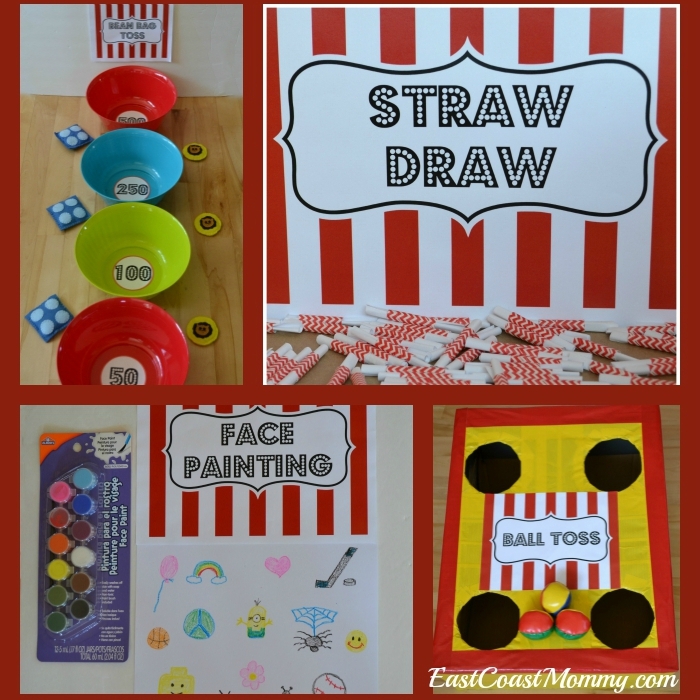 With a small amount of effort, you will have a board full of prizes that can be claimed by choosing a cup and "poking" through the tissue paper. 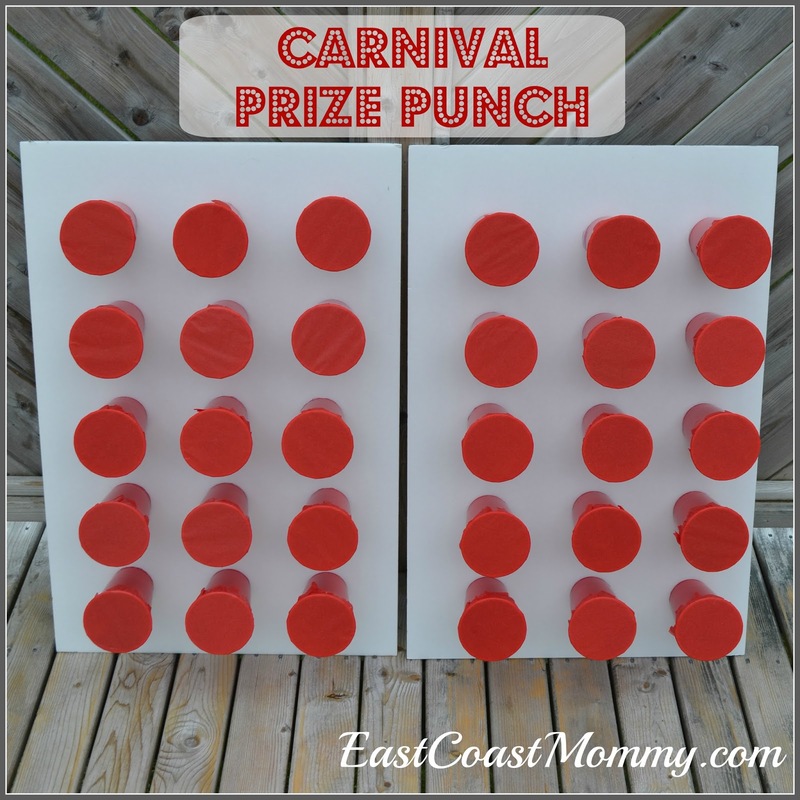 Isn't this inexpensive DIY prize punch adorable? I love that the prizes and colours can be customized to any party theme. It would be fun for a Christmas countdown too. 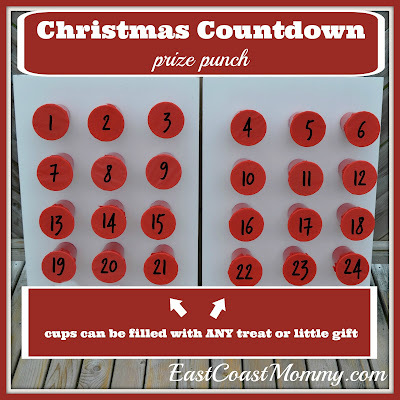 This would work really well for an Advent Calendar too (but perhaps at a smaller scale). It really would. Great idea! Me encanta! eres muy creativa. Congratulations! Hi! I love this idea! Can you tell me what size cups did you use? Oh also, what size is the foam core board? I used Solo cups, and the foam core is poster sized. what size solo cups did you use? 9oz etc Thanks! You could use any size. Mine were the regular-size ones they had at the dollar store. They were big enough to fit hockey cards. Did u hang this up or was it set on table? N also did use glue gun to glue cups on board? Did u hang this up or was it set on table? 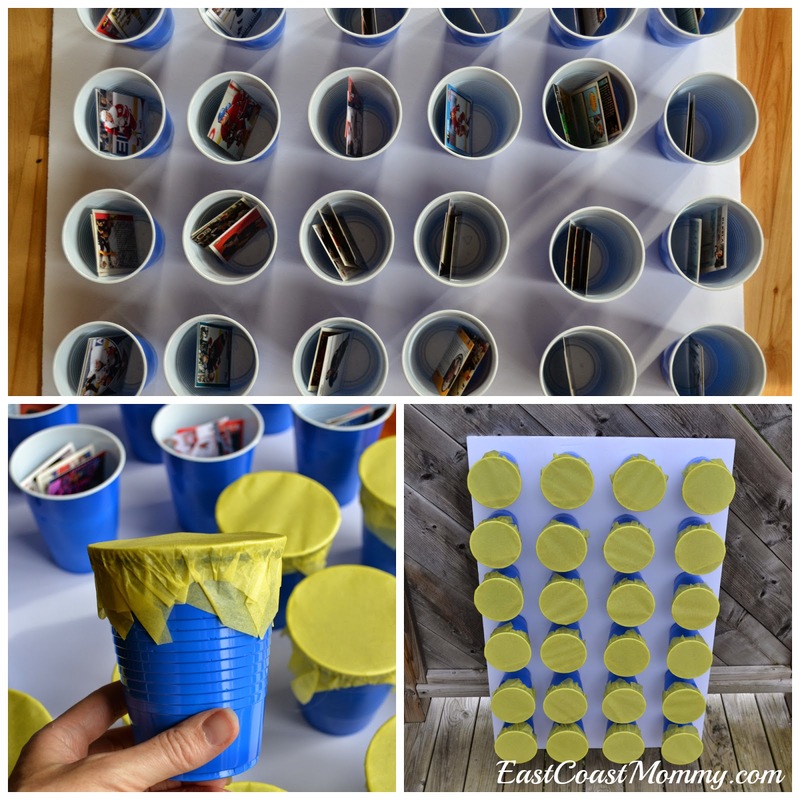 And did use glue gun to glue cups on board? I set it on the floor, and I used a glue gun. The step by step instructions are in this post. 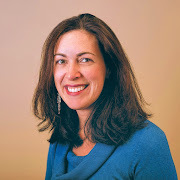 hi, how did you work the tickets? did they start out with tickets, earn tickets at games etc? Hi There! I am in the process of making this but one question...how do you stand the foam board up and keep it from falling back when kids punch through it? Thanks! I just lean it up against the wall. Oh! Ok, I'll try that...we have some rambunctious ones so I'll have to tell them not to go crazy kung fu on it! Thank you!! I made this twice for classroom parties and school carnival. I used rubber bands instead of glue. For the carnival I made up serveral boards ahead of time. I used different size cups depending on the size of the prizes. I called it "bop it"
You could try something else, but it would have to be strong. I'd recommend picking up a cheap glue gun. You can find them at the dollar store. Did you read the instructions above? I explain it all step by step. If you have any other questions, let me know. I did this for my daughter's baby shower and people enjoyed this game. This is so simple and easy! 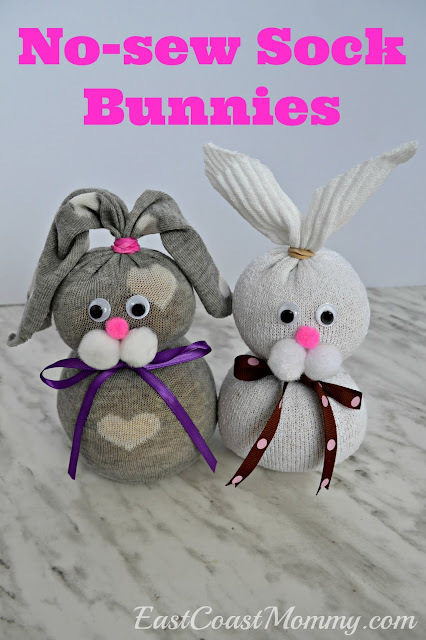 Thanks for sharing, I would customize the prizes with candy for my daughters' birthday! 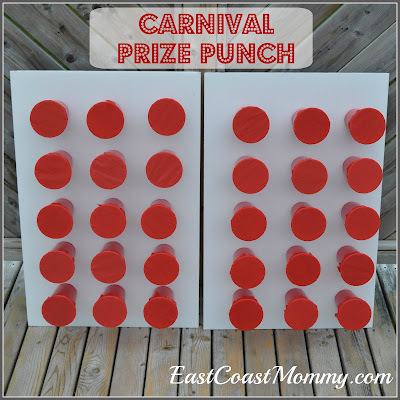 To "punch it", have you had children take turns at the board pushing their hand through? Would you recommend a rubber dart for kids to throw at the cup to punch it? Or perhaps a dart gun if there was only one layer of tissue paper? I usually have the kids take turns poking their hands through... but I have also let them use bouncy balls or NERF guns. You can decide based on the age of the kids and the party theme. hi. thanks for the fun idea. i am planning to make it this weekend, but just want to make sure i buy the correct thing. Is foam core board styrofoam board in the size of a poster board, or is it the cushiony poster board used for lots of kid crafts, or neither one? What a nice post. I have found it extremely useful and informative. Thanks for sharing. Talking about DIY recently I came across an amazing DIY guide called "Ted's Wood Working.". It is quite simple, cheap and extremely useful and effective. The artwork that is made with it are simply outstanding. Therefore I would request everyone who has a knack for DIY to try it out at once and see the result by themselves. Buy Printed Lawn Collection 2019 Online for Women's at best prices available at Motifz. ✓ Latest Fashion, ✓ Trendy Designs ➤ Shop Now!